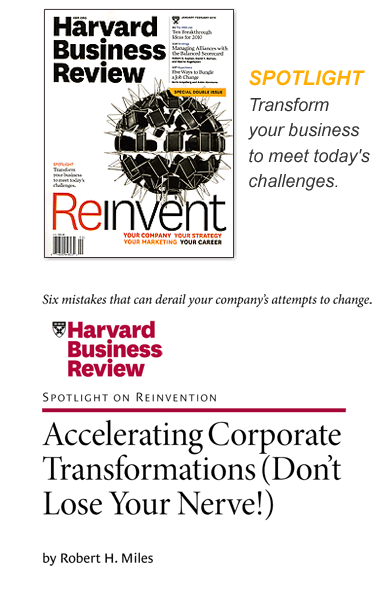 Robert H. Miles, Harvard Business Review Accelerating Corporate Transformations: Don't Lose Your Nerve! Six mistakes that can derail your company's attempts to change. "Ask any CEO who has overseen a corporate transformation what should have been handled differently, and you are likely to get this answer "We should have—and could have-moved faster. Such executives have a long list of regrets: They wish they had unified the leadership team right away. They wish they had engaged employees sooner and quickly drummed up support for the new vision. They wish they hadn't waited so long to test their assumptions and refine their key initiatives. And they wish they had generated some visible returns early on, to accelerate the commitments and reinforce the expectations of employees, customers, suppliers, and investors. Transformation launches must be bold and rapid to succeed. Yet, embedded in most organizations are six kinds of "speed brakes” that can slow things down to a grinding pace. During business-as-usual periods, these brakes may be irritating, but their effects on performance are reasonably benign. However, during a bold transformation, which requires rapid action, any one of them can derail the larger effort. To accelerate transformations, managers need to release each of these brakes, in a particular order. Even one of the speed brakes can bring an entire corporate transformation and all related breakthrough-performance aspirations to a sudden halt. Some of the methods for releasing the brakes may seem counterintuitive. For instance, it might not be obvious at first how you can accelerate change by pausing to establish safe passage or setting time aside for structured dialogue, or how you can accomplish sweeping transformation by restricting your focus to a very few important initiatives. But the tactics discussed in this article will help you plan and execute a rapid corporate reinvention that actually sticks. This is a discipline that all CEOs and general managers will have to master to be successful in the twenty-first century." Reference: Robert H. Miles, "Accelerating Corporate Transformations (Don't Lose Your Nerve)," Harvard Business Review, January-February 2010, Spotlight on Reinvention issue, pp. 67-75. Copyright © 2019 by Corporate Transformation Resources LLC. All rights reserved.